When it comes to killing off parasites in the system, Ayurveda is a leading medical science for treatment. Ayurveda has been treating parasitical infections for thousands of years and the efficiency of its herbs and therapies are unmatched. 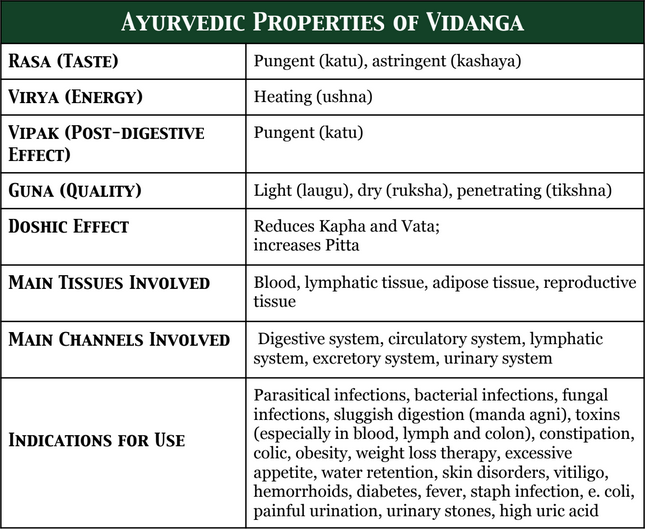 Of these Ayurvedic herbal treatments, Vidanga may quite possibly be the most widely used and powerful herb for killing parasites and healing infections of all kinds (bacterial, fungal, etc). 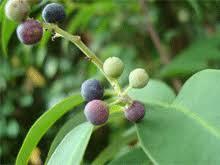 Although its main use is thought to be for killing off parasites, Vidanga possesses many other health benefits. It is a powerful detoxifier, specifically for the blood, lymphatic system and colon. Because of this, it is used in many cleansing Ayurvedic formulas such as Tikta Ghrita, Triphala Ghrita and Mahasudarshana Churna. Vidanga is a great weight loss aid, as it reduces the appetite, increases Agni (digestion), and promotes healthy elimination. As a powerful purgative (laxative), it can often be used when treating general constipation as well (see instructions below!). Due to Vidanga’s heating property, this herb is best for Kapha and Vata disorders, as it can often exacerbate any Pitta issues (hyperacidity, excessive heat, anger, diarrhea, etc). If there is a great need to use Vidanga while there is also a Pitta imbalance, it would be best to use it in smaller dosages and blended with Pitta-reducing herbs such as Neem, Kutki, Aloe, and Guduchi. As a very potent herb, it is not recommended to use Vidanga in high dosages for longterm, although high amounts may be needed in the beginning (especially for severe parasitical infections). If the treatment is needed longterm, one should eventually reduce the dosage of the Vidanga and formulate it with other similar herbs. In fact, most herbs of similar properties tend to be more effective when they are taken together (called Yoga Vahi). 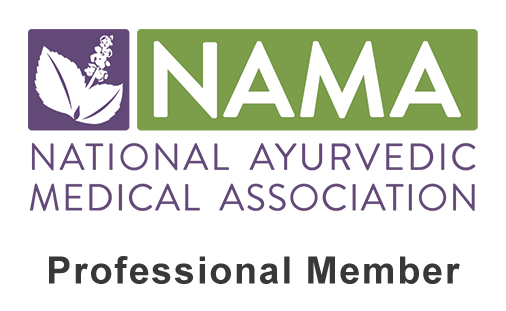 Overall, it is always best to seek guidance from a skilled Ayurvedic practitioner in order to receive the most effective and safe treatment. Take 1/2 tsp Vidanga, 1/4 tsp Neem, and 1/4 tsp Chitrak in 1/2 cup of warm water three times a day, before meals for 7 days. On the 7th day, take 1-2 Tbsp of castor oil mixed in warm ginger tea before bed. NOTE: The castor oil will cause a strong purgative (laxative) effect and will help flush the colon of the dead parasites. Be cautious however, as taking the castor oil in larger dosages such as this tends to cause loose or watery stools. Therefore mild food should be taken the day of and the day after this therapy. Plenty of rest should be allowed at this time as well. After this week of taking the larger dose of these herbs (followed by the purgation), continue with the formula as 1/4 tsp Vidanga, 1/8 tsp Neem, and 1/4 tsp Chitrak in 1/2 cup of warm water three times a day before meals for 30-60 days. Avoid the castor oil therapy however, as this should only be performed periodically unless under the direct guidance of a knowledgeable practitioner. Also try our Parasite Cleanse Tincture! Take 1/2 tsp Vidanga, 1/2 tsp Guduchi, and 1/4 tsp Neem in 2 Tbsp of organic aloe juice (I really enjoy the Lakewood Aloe brand!) three times a day before meals. On the 7th day, take 1-2 Tbsp of castor oil mixed in warm ginger tea before bed. NOTE: The castor oil will cause a purgative effect and will help flush the colon of the dead parasites. Be cautious however, as taking the castor oil in larger dosages such as this tends to cause loose or watery stools. Therefore mild food should be take the day of and the day after this therapy and plenty of rest should be allowed. After this week of taking the larger dose of these herbs (followed by the purgation), continue with the formula as 1/2 tsp Guduchi, 1/4 tsp Vidanga, and 1/8 tsp Neem in 2 Tbsp of organic Aloe Juice three times a day before meals for 30-60 days. Avoid the castor oil therapy however, as this should only be performed periodically unless under the direct guidance of a knowledgeable practitioner. Also try our Parasite Cleansing Enema Kit! Take 1/4 tsp Vidanga, 1/4 tsp Turmeric, and 1/8 tsp Neem in 1/2 cup of warm water three times daily before meals. Take this for up to 30-60 days or as long as needed (without exceeding this limit). *Alternatively, one can take 1-1/2 tsp of Mahasudarshana Churna, twice daily. Take once in the morning on an empty stomach and again before bed. Take 1/2 tsp Guduchi, 1/4 tsp Vidanga, and 1/4 tsp Musta in 1/2 cup of warm water three times daily before meals. Take this for up to 30-60 days or as long as needed (without exceeding this limit). Take 1/2 tsp Anantamul, 1/4 tsp Vidanga, and 1/4 tsp Manjishta three times daily. Mix these herbs in 1/2 cup of warm ginger tea (replace with 1/2 cup of warm water when needed) and take up to 30 minutes before meals. *Alternatively, one can take 1/2 tsp of the Daily Detox Formula, three times daily in warm water before meals. Take 1/4 tsp Vidanga, 1/4 tsp Ginger, and 1/4 tsp Chitrak mixed in 1-2 tsp of honey. Wash down with warm water. Take this mixture three times daily, 10-15 minutes before each meal. Take 1/4 Vidanga, 1/4 tsp Guggulu, and 1/4 tsp Trikatu mixed in 1-2 tsp of honey. Wash down with warm water. Take this mixture three times daily 10-15 minutes before each meal. Mix 1/2 tsp of Triphala Churna and 1/4 tsp of Vidanga in warm water. Let this mixture steep for 1-3 minutes, then stir well and drink quickly. Wash down with plain warm water. *For severe constipation increase the dosage to 1 tsp Triphala Churna and 1/2 tsp of Vidanga until the constipation has been relieved (up to 7 days), then continue on with the original recommended dosage. 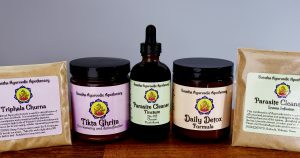 Try our Complete Parasite Cleanse Kit! 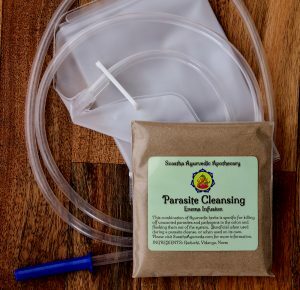 Try our Parasite Cleansing Enema Kit!